This is one in a series of periodic blog posts on planning ethics issues. An annual report on planning ethics was posted on the APA website in January, in accordance with the requirements of the American Institute of Certified Planners (AICP) Code of Ethics and Professional Conduct (section C5b). 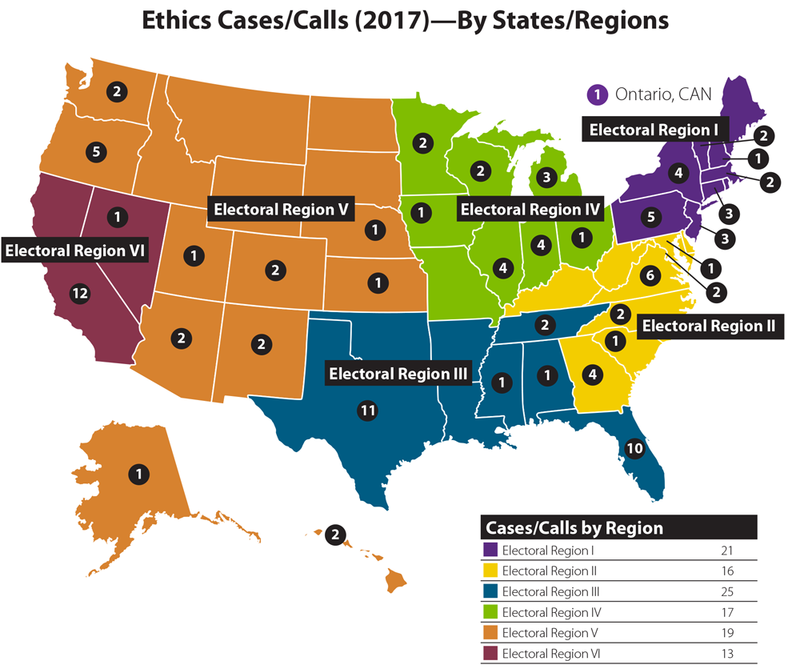 This summary of activities for 2017 includes ethical misconduct cases, informal inquiries, and disciplinary actions taken last year by the Ethics Officer and the Ethics Committee, which is appointed by the AICP Commission President. The annual report also tracks the most common ethical topics raised in informal inquiries and in formal complaints of misconduct. “Conflicts of interest” issues (i.e., Ethics Code Rules of Conduct #3, #5, and #6) ranked number one, followed by “loyalty to employer” (Rules #4 and #5), “respect for confidentiality” (Rule #7), and “honest and fair dealing” (Rules #11 and #17–20). What other lessons can we learn from last year’s planning ethics-related activities? 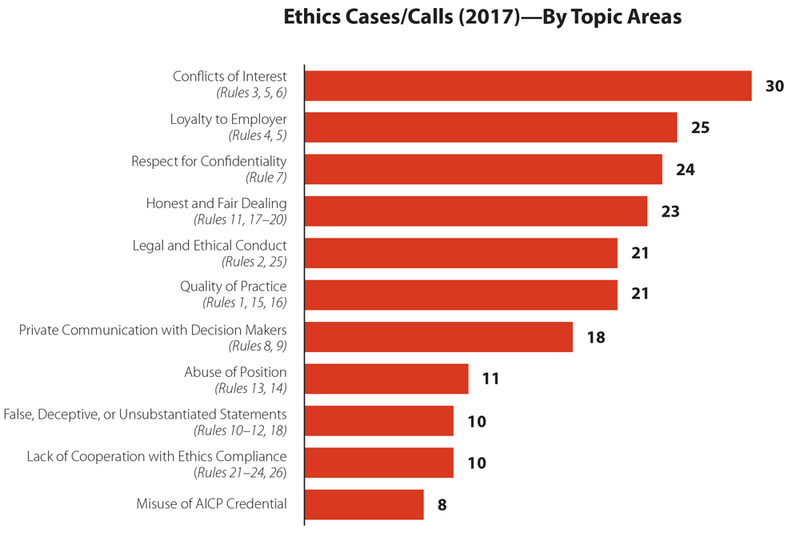 Despite the size of the profession (38,000 APA members, 16,800 of whom are AICP members), the number of ethical misconduct complaints — just 14 for the year — was relatively small compared with other related professions. Six of last year’s complaints were filed by private citizens; five of those complaints were dismissed. Five of the complaints were filed by non-planning staff members, while three were filed by planners (one by an AICP member). Only two of those eight complaints were dismissed. Two misconduct cases resulted in public disciplinary actions — one for a “serious crime,” the other for “secondary employment” and “personal gain” (see annual report for more details). Two misconduct cases were resolved by confidential “letters of admonition” sent to the professional planners. There were five additional cases in which planners who were not members of AICP were charged with using the AICP credential. In each case, the planner agreed — in writing — to cease using the credential following a warning letter from the Ethics Officer. More than 100 informal inquiries were received — and answered — by the Ethics Officer. These inquiries came from 37 of 50 states (and one province) and were evenly distributed based on APA member population. If you would like to seek informal advice on an ethics matter, please leave a voice mail message for the Ethics Officer at 312-786-6360. If you would like to file a misconduct complaint against an AICP member, please complete an ethical misconduct form, which can be downloaded at www.planning.org/ethics. If you would like to report someone you believe is misrepresenting themself as an AICP member, please send an email to ethics@planning.org. Jim Peters, FAICP, was appointed the AICP Ethics Officer by the AICP Commission in April 2015. Among the duties of the Ethics Officer are: investigating complaints of ethical misconduct, providing informal ethics advice to membership, helping to develop educational materials, and serving as staff to the Ethics Committee.